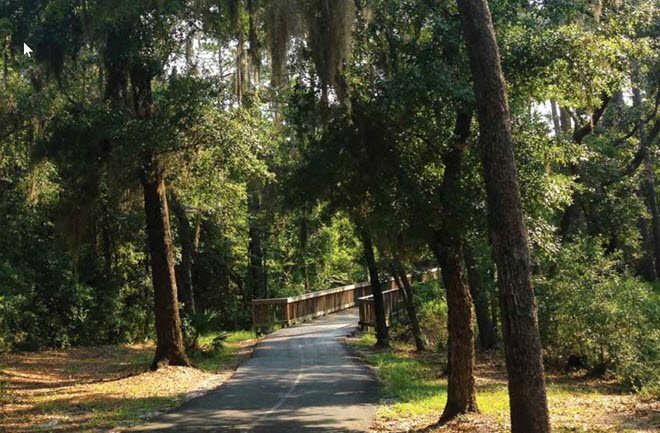 Guided EcoTours - Friendly and knowledgeable tour guides help you explore the wildlife of our Pleasure Island with a 2 hour trip through the pristine woodlands and natural habitats of the Backcountry Trail. Reservations are only $15 per person. The Kids Boulder Park - Bringing more fun and attractions to the already adventurous trail, rock climbing at the new Boulder Park keeps kids in shape and helps to develop both physical and mental skills. Coordination, strengthening and flexibility are just a few benefits that result from the sport while promoting focus and other positive attributes to maintain a healthy lifestyle. Butterfly Garden & Pavilion - A vivid array of colors from blooming flowers and butterfly wings make the Butterfly Garden a perfect place to relax and enjoy the natural beauty of the trail. The nearby Pavilion, offers a screened enclosed cabin style building is conveniently near the trails restroom and water facilities. Primitive Campsites - Nestled among tall pines, scrub oaks and 15 miles of breathtaking Trails is the addition of the new Primitive Outpost Campsite. Reminiscent of a Huck Finn adventure, this amenity hosts three individual sites, constructed with canvas tents supported on rustic hardwood floors and roped together with framed recycled downed trees. Geocaching - All ages can enjoy and appreciate a good treasure hunt; and that’s what you get when you go geocaching on the Backcountry Trail! Home to many beautiful birds, animals, plants and flowers, but more recently it has become home to hundreds of containers called geocaches. Details at geocaching.com. The Hugh S. Branyon Backcountry Trail is open during daylight hours only. No motorized vehicles. Bicycle speed limit is 10 miles per hour. No fires or smoking. Pets must be leashed at all times. For more details, including upcoming events go to backcountrytrail.com or call 251-381-1180. For information on the Alabama State Parks, go to alapark.com/gulf-state-park. In addition to the Trail’s many attributes, it is also considered a bird watching paradise and listed on the Alabama Birding Trail Registry.